Note: This post addresses the Businessweek article and discusses official LDS reaction; individual rank-and-file LDS reaction is documented in this subsequent post. On July 12th, 2012, the Church of Jesus Christ of Latter-day Saints issued an official response to an article about the Church's business operations entitled "How The Mormons Make Money", which was published on the Bloomberg Businessweek website on July 10th. In their response, the Church outlined the historical origins of its thriftiness, provided a brief tutorial on tithing and the five key areas supported by tithing funds, and, perhaps most importantly, explained how the Church's business assets support the Church's mission and principles by serving as a rainy day fund. However, the proposed cover of the print version of Businessweek (upper left) drew a sharper and more critical response from the LDS Church. In a separate email response, LDS Church spokesman Michael Purdy wrote, "The Businessweek cover is in such poor taste it is difficult to even find the words to comment on it. Sadly, the cover is a reflection of the bias and speculative nature of the article itself. It is narrow and incomplete, omitting, for instance, a good deal of information given on how church resources are used. The article misses the mark and the cover is obviously meant to be offensive to many, including millions of Latter-day Saints." According to Politico, the original title of the article was to be the more slanted and provocative “Latter-day Lucre: How the Mormon Church Makes Its Billions”; no explanation for the title change is offered. Local Utah coverage of this story is also provided by KSL Channel 5, the Salt Lake Tribune, and the Deseret News. The comments appended to each story provide a good snapshot of informal public reaction. The Businessweek article itself is worthy of further dissection and analysis, because it does provide a well-researched and organized snapshot of LDS business holdings not readily available elsewhere in similar form. First, aside from the controversial cover, the character of the article seems to be particularly pro-Mormon or anti-Mormon; any inaccuracies can most likely be attributed to ignorance rather than malevolence. Extensively cited is Keith B. McMullin, a former member of the Presiding Bishopric who now heads up Deseret Management Corp. (DMC), an umbrella organization for many of the Church’s for-profit businesses. McMullin states “The Church of Jesus Christ of Latter-day Saints attends to the total needs of its members. We look to not only the spiritual but also the temporal, and we believe that a person who is impoverished temporally cannot blossom spiritually.” This last statement is NOT to be confused with the contemptible Prosperity Theology heresy which has infected part of Christianity and which sends the message that God loves the rich more than the poor. 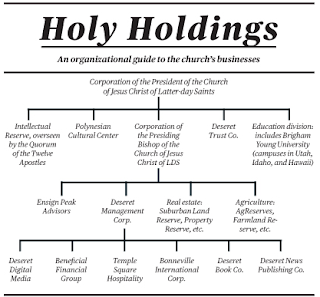 McMullin also states that not one penny of tithing goes to the church’s for-profit endeavors, but the new donation slips used by the Church now state on the bottom “Though reasonable efforts will be made globally to use donations as designated, all donations become the Church’s property and will be used at the Church’s sole discretion to further the church’s overall mission.” Although McMullin did not provide any numbers about the LDS Church's new worth, a recent investigation by Reuters in collaboration with sociology professor Cragun estimates that the LDS Church is likely worth $40 billion today and collects up to $8 billion in tithing each year. Times and Seasons points out that Winter’s “recently published article co-written by Cragun” with this estimate appears to be this article, which was published in Free Inquiry, the quarterly magazine of the Council for Secular Humanism. Cragun is a co-author, and the Free Inquiry article indeed makes the monetary claims in question. The direct comparison of 29 percent to 0.7 percent is misleading. The LDS Church statement points out some of the church's additional humanitarian and other efforts were not included. For example, Businessweek did not detail the church's operation of chapels and temples around the world, investments in higher education, local welfare programs, its Perpetual Education Fund, family history program, and missionary work. Hundreds of thousands of hours of donated service, of which no financial value is calculated, underpin Church programs such as these. Furthermore, the Church absorbs the administrative costs of these ventures. One prominent Evangelical weighed in. Richard Mouw, president of the Fuller Seminary, which is a graduate-level seminary for Evangelicals, said "This cover ridicules respected spiritual leaders and the Mormon faith by distorting a picture of sacred value and respect and turning it into a caricature. To be clear, a journalistic examination and analysis regarding the financial practices of any group is always fair game. But if such mocking and distortion were focused on Evangelicals or Catholics, we would call foul. For the Mormon community--and all of us--this is out of bounds".